In that empire, the art of cartography attained such perfection that the map of a single province occupied the entirety of a city, and the map of the empire, the entirety of a province. In time, those unconscionable maps no longer satisfied, and the cartographers’ guilds struck a map of the empire whose size was that of the empire, and which coincided point for point with it. The following generations, who were not so fond of the study of cartography as their forebears had been, saw that that vast map was useless, and not without some pitilessness was it, that they delivered it up to the inclemencies of sun and winters. In the deserts of the west, there are tattered ruins of that map, inhabited by animals and beggars; in all the land there is no other relic of the disciplines of geography. — Lewis Carroll, The Hunting of the Snark (1874), Fit the Second. If you have a particular sort of mind then maps are fascinating. If you share this fascination, you’ve probably had the frustrating experience of trying to explain it to a friend, relative or partner who doesn’t. (If you don’t share it, you’ve probably had the still more frustrating experience of having it explained to you by a friend, relative or partner who does.) As you’ve probably guessed, I’m one of the people who does. I’m also, professionally speaking, interested in mathematical models: how to construct them, how to analyse them, and what we might be able to learn from them. In this article, I want to look at maps from that perspective. I’m going to suggest that maps can be seen, like many other models, as somewhere that the “objective” world of mathematics meets the “subjective” world of aesthetics and value judgements; and that by exploring the mathematics of maps we can perhaps learn a little about the complex relationship between these worlds. A map is a way of associating unique objects to every element in a given set. So a map from to is a function such that for every , there is a unique object . The terms function and mapping are synonymous for map. What we mean by a map in the everyday sense is a special case of this, where the set is usually (some portion of) the Earth’s surface, and the set is (some portion of) a two-dimensional plane. Before we specialise, though, it’s worth making a basic point about maps in the mathematical sense. This point is so obvious it’s easily overlooked. A map can be defined in any completely arbitrary way that satisfies the definition above. (For example, we could perversely define a map by writing as a binary expansion then changing every 0 to 1 and vice versa.) However, completely arbitrary maps are usually not very interesting. As so often in mathematics, the interesting objects are those that satisfy some constraints. For example, a map may be continuous everywhere (or almost everywhere), so that nearby points in generally end up as nearby points in . (Of course, we have to define what we mean by “nearby” in each case!) A continuous map preserves, in some sense, the property of “being nearby”. For maps between two-dimensional regions, we could choose to preserve other properties, such as the relative areas of sub-regions, or the angles between every pair of intersecting lines. If we insist that every property is preserved, we will have to require that , and we will end up with the rather boring identity map . The most interesting maps, both from a mathematical and from aesthetic and practical points of view, are those that preserve some, but not all, of the relationships between points in the original set when these points are mapped to . To illustrate this, let’s consider a very classical category of maps, conformal maps. These can be thought of as functions that map one complex number to another, or equivalently as geometrical transformations which take one copy of the -plane and distort it into another copy (or copies, or part) of the -plane. The key property of a conformal map is that it preserves the angles at which lines intersect. If you’ve done a class on complex analysis then you’ll be familiar with some of the neat mathematical properties of conformal maps. Even if you haven’t, it’s possible to appreciate them visually. There are some great visualisations on the CNRS website (from which the image above originates); and if you can’t read French, much of that page has been rehashed as a Wikipedia article. One of the reasons that conformal maps are often so visually appealing may be that there’s a connection between the patterns they create and the streamlines of the potential flow of an inviscid fluid — and the human brain has surely evolved to be able to appreciate the shapes we see in rivers, clouds and so on. But that’s pure speculation on my part! I hope your immediate reaction was something like “but that’s upside down!”, and that your next reaction was something like “no, hang on: it’s just that there’s a convention that North goes at the top of maps”. But — at least if your brain works anything like mine — it’s almost impossible to look at the South-upward map in quite the same way you look at the North-upward map. Different features will stand out: for me at least, the Irish Sea suddenly becomes a lot more prominent, and the south-east of England looks dreadfully remote from everything of interest. Some other features of the map above are worth mentioning. 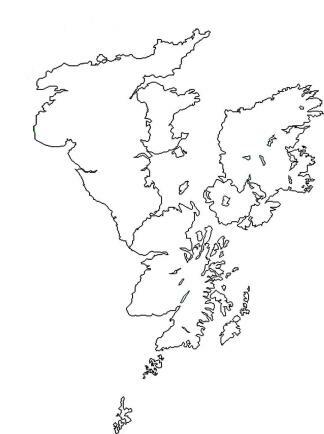 Note that national and international borders are marked, but not cities; lochs and islands above a certain size are marked, but not rivers or intertidal regions. As the Borges quotation at the top of this article suggest, no map can be perfectly accurate unless it’s both life-size and infinitely detailed. So, like all maps, this one is an accumulation of choices about what should be included and what should be omitted — in other words, what should be preserved and what shouldn’t. Books could be (and have been) written on just about every aspect of the compromises that map-makers make, and the often hidden biases they bring to the task. I’m going to look at just a couple, in each of which mathematics ends up playing an important role. The relationship between mathematicians and map-makers goes all the way back: the very word “geometry” means “earth measurement”, and the ancient Greeks believed that geometry had developed from the ancient Egyptians’ need to survey the fertile land flooded annually by the Nile. It’s rather pleasing that classical geometry and classical geography both flourished spectacularly in the Graeco-Egyptian city of Alexandria, with the work of Euclid and Eratosthenes respectively. Eratosthenes is particularly famous for two achievements: estimating the size of the Earth and producing perhaps the first recognisable map of the Earth, a reconstruction of which is shown below. C19th reconstruction of Eratosthenes’s map of the world. It was rather convenient for Eratosthenes that the known world appeared to consist of a land mass surrounded by sea, and that although the Earth was known to be spherical it had never been circumnavigated. This made it possible to draw a map of the interesting bits without worrying about what lay on the other side of the globe. (Many centuries later, Dante used the same licence to place the Mountain of Purgatory on the unexplored side of the globe, exactly opposite Jerusalem.) What was convenient for Eratosthenes as a geographer, though, was a shame for him as a mathematician, because it let him dodge the really interesting question: how should one represent the curved surface of the Earth on a flat map? A mapping (in the mathematical sense) from the Earth’s surface to a flat plane is called a projection. This term reflects the fact that we can often construct projections geometrically: you can imagine a glass globe with the continents marked on it, then imagine shining a light through this globe so that it casts shadows onto a sheet of paper that has been wrapped around the globe in some manner. With modern notation, however, it is often easiest to understand projections by specifying the mapping in algebraic terms. This is known as the equirectangular projection. Unfortunately, despite its algebraic simplicity it doesn’t have any particularly useful properties, and so it is rarely used. 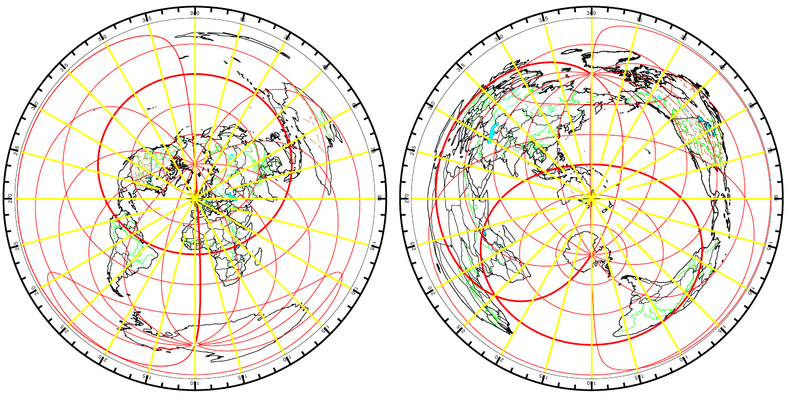 Although the equirectangular projection is among the oldest known (it’s attributed to Marinus of Tyre in about AD 100), it was a different projection that first established itself firmly in common use. A modern rendering of Mercator’s projection (from Wikimedia). Mercator’s projection suffered the usual fate of an invention designed to do one thing supremely well: it was used for all sorts of purposes for which it was neither intended nor appropriate. Until fairly recently, for example, it was the standard world map used for teaching geography in schools. This was despite the fact — always well known to cartographers — that in some respects this projection seriously “distorts” the picture of the world. The obvious way to avoid shrinking the poorer parts of the world is to change the demands we make of a projection: instead of preserving angles at the expense of areas, we can require that relative areas are preserved at the expense of angles (i.e. of shape). A rendering of the Gall-Peters projection (from Wikimedia). The most famous member of this family is the Peters (or Gall–Peters) projection, which sets and which generated a lot of unnecessary controversy in the 1970s when the filmmaker Arno Peters promoted it as an alternative to the Mercator projection. The main good to come out of that controversy is that it broke the monopoly of Mercator on popular world maps, and opened the door to the use of a much wider range of other projections, each of which makes a different and equally debateable set of compromises. As an example of a completely different set of compromises, here’s one of my favourite projections. Rather than trying, like the Peters projection, to be as “objective” as possible, the approach here is to be completely egocentric. We fix a particular location which will become the centre of our map. We then require that (i) each great circle through maps to a straight line through the centre of our map; (ii) the bearings of these great circles, measured at , are preserved; (iii) the distance from to each point is preserved. These projections — known formally as azimuthal equidistant projections — are particularly useful to ham radio operators, because they allow you readily to identify the direction and distance of a remote transmitter. Some of these operators have produced a very nice online tool which allows you to generate projections centred on any given location: a couple of examples are shown below. Perhaps the most famous examples of information-shaped maps, though, can be found at the back of street atlases and pocket diaries everywhere: the maps of mass transit systems such as the Paris Metro and the London Underground. What these maps preserve is the network structure — which stations are linked to each other by which lines — and the geometry is chosen to make this structure as clear as possible. Maps like the Tube map are obviously not geometrically accurate, but it’s interesting to consider how much they shape our perception of a city’s geometry nevertheless. For example, how many of us who’ve travelled through London but have never lived there really appreciate how close together the tube stations near the centre are, or how the radial lines wriggle their way across the outer zones? Every point of the plane that was exactly at the position of one of the anchors should move to the respective destination. All points between the anchors should be transformed in a way that the original plane is mapped with as little distortion as possible and possibly without overlapping. The transformation should be as close as possible to an affine transformation. Each point in the plane is now mapped to its transformed position by , where , and where the weights are determined such that and such that . but in fact this does not perfectly satisfy . However, it’s easy to patch up the transformation by taking for some positive number (and handling the removable singularities at in the obvious manner). Different choices of now give different distortions, as the pictures below illustrate. 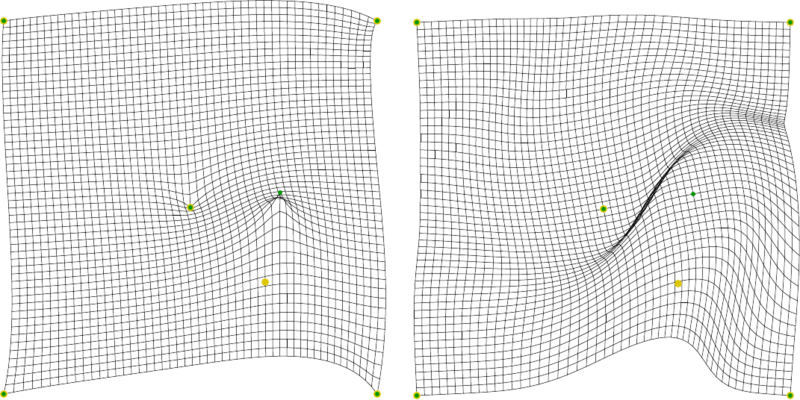 Distorted meshes using n=1 (left) and n=4 (right), when a single anchor point is moved. (Click on image for a larger version.) Images courtesy of Hartmut Bohnacker. Ultimately, after quite a bit of experimentation, the arbiter of the choice of and was simultaneously very simple and very complicated: what made the final map look best? The best material model for a cat is another, or preferably the same cat. — Norbert Wiener and Arturo Rosenblueth, “The role of models in science”. Philosophy of Science 12(4): 316–321 (1945). I hope that this article has persuaded you that constructing a map has a lot in common with constructing other kinds of model, mathematical or otherwise. A model always simplifies the phenomenon it represents — otherwise, like the inhabitants of Borges’s fictional empire, one might as well throw away the model and use the original instead. It is, inevitably, in some sense a distortion: not every property of the original can be included in the model, and generally not all the relationships between these properties can be preserved. There’s a widespread and quite incorrect belief that by making a model more mathematical (or, alternatively, by cramming a model with more and more data analysed with more and more complex statistical tools) we can miraculously get round this and produce a model that is to all intents and purposes objective. Sadly, this is a delusion: our models and our maps will always reflect the decisions we made in building them; and we can never decide what to include and what to preserve in a model on a completely “objective” basis, no matter how hard we try. What the story of maps should suggest to us is that nevertheless we needn’t give up hope. Rather than thinking of maths as a way to make our subjective decisions objective, we can think of it as a way to mediate between the model and the phenomenon. Phrasing our model mathematically may — not “will” — make it easier for us to see which compromises we can hope to make and which (like preserving both angles and areas in a flat map of the Earth) are plain impossible. It should also force us to be more precise in the demands we make of a model and the compromises we choose. As with the equal-area projections, a mathematical formulation may suggest a generalisation, and putting a whole family of different choices together may help us to spot how the compromises we make affect the perceptions we develop. Acknowledgements. I’m grateful to Dr Ann Fielding for helping to educate me about mediaeval maps, and to Hartmut Bohnacker for answering a lot of daft questions about his algorithm!